I have written about ChatZum before, when it was being added to installers downloaded from Softonic. Although Softonic never admitted to doing anything wrong, other than installing the adware even when users opted out during installation, I have at least not seen any signs that this misbehavior has continued. However, ChatZum has nonetheless resurfaced, with a slightly different form, in another application’s installer. By default, all the boxes shown are checked. If you compare this to a similar screenshot of the ChatZum-added VLC installer, you’ll see remarkable similarities. Further, if those boxes are left checked when installing, not only is a Nation toolbar browser extension installed, but all the ChatZum components are also installed (other than the ChatZum browser extension, which appears to have been replaced by the Nation toolbar extension). Just as observed previously with ChatZum, opting out during installation (by unchecking the boxes, as shown in the screenshot above) does not work fully. 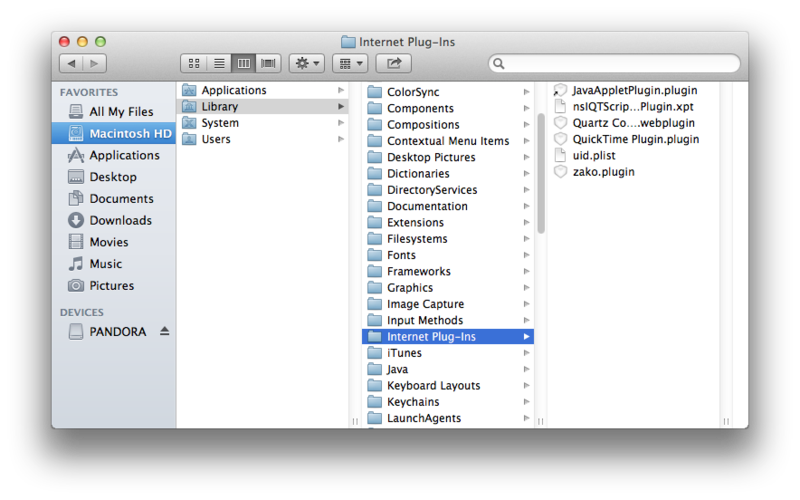 In this case, opting out still results in the zako.plugin and uid.plist components of ChatZum being installed. It’s unclear at this time exactly what the involvement of TuneUp is. It’s entirely possible that they are unwitting dupes, tricked into including this malware as a means of bolstering what were probably not particularly spectacular sales. They may be completely unaware of how their software is behaving, although that would not really be forgivable, as a decent developer should be intimately familiar with exactly what their installer is doing. Even in this best case scenario, as opposed to the possibility that they are actively involved with ChatZum, TuneUp Media would have to be so clueless about what they’re selling that it would be wise to avoid their product altogether. ChatZum (also known as Zako or Okaz) is still far from universally recognized as malware by anti-virus software. Most either doesn’t detect it or only calls it adware. However, this new development, showing a continued willingness to install their software contrary to the user’s preferences, will change that to some degree. September 26, 2013 @ 2:48 PM EST: A new version of TuneUp is now available on the TuneUp Media web site. This version no longer uses the installer that included ChatZum, allowing users to simply drag the app to the Applications folder. They report that the installer was built for them by a third party, who added ChatZum to it. I found Nation as part of a “RAR.pkg” about a month ago. 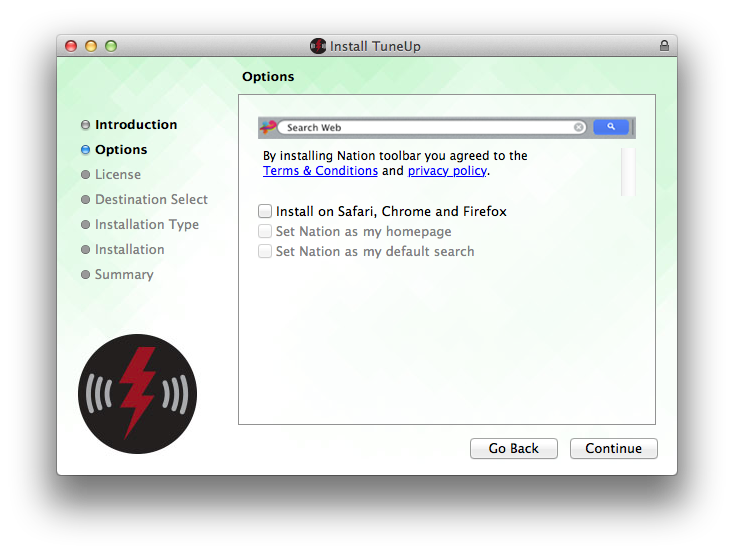 The same installer has an optional built-in installer for TuneUp. The installer for “RAR.pkg” actually listens to the user when they opt-out but it’s tricky. Out of the 3 checkboxes if the first one is unchecked the other two grey out but remain checked. So for the user to really opt-out the boxed have to be unchecked in reversed order starting with the last one. It installs NationBar.safariextz in Users/Library/Safari/Extensions and nowhere else (in the case of the “RAR.pkg”). Is this the same for the TuneUp installer? Though the name changed from ChatZum to Nation, it’s recognized as being part of/related to Okaz. As you said, not by many AV apps, in fact so far Intego VirusBarrier 2013 is the only one that found it. That’s exactly the same as what I’m seeing with the TuneUp installer. Where did you download that RAR.pkg file? Was it from somewhere like Softonic, or did you get it directly from the developer’s site. (In the case of TuneUp, the dodgy installer that I downloaded came straight from their web site. It was submitted by a reader who didn’t mention the origin. His previous samples came from virusshare. I label all my samples with the virustotal MD5, this one is 3aa9d0d96ee2202deda7d923e5e2b9ab if that helps. I read your previous post about getting rid of ChatZum ad hopefully I managed to get all involved files and deleted them – thanks to your instructions. we used to have a bug in the installer in Softonic where the offer was installed even if the checkbox to select the product was selected. this has been corrected 2 month ago and since then the install flow works flawlessly. 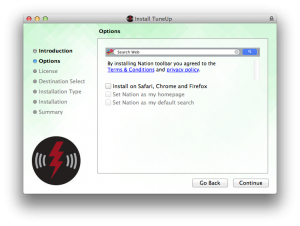 – TO BE CLEAR: the TuneUp offer screen in Softonic is an offer included that is also optional and users can choose not to install this as part of the flow. – if the package is performing anything that its not suppose to we would be happy to be informed. to our best knowledge its all within the specification and users can choose not to have the offers installed and we have double checked to see that it works as it should. we are available at support@chatzum.com for any questions or comments. Interesting that you confirm that you are still working with Softonic. That means that I must continue to recommend boycotting Softonic. 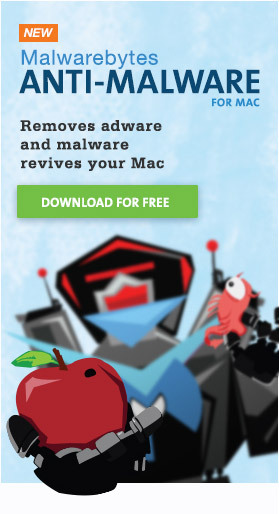 Doesn’t the tuneup installer also download & install Mackeeper ? No, not in my testing. OK, thanks – I asked, since the run.sh run from postflight provides for a conditional install of mackeeper and macpaw, but on a closer look, the tests probably aren’t met. I’ve seen that sort of thing before. Another adware app that’s in a kind of ethical gray zone, Genieo, was known at one point to have code in its installers designed to download and install the Codec-M adware/malware. I never actually saw it do that, but the mere presence of the code simply ads more suspicion. Thanks for bringing that up! I can tell you that I am using a fully paid ($49) version of TuneUp so I do not expect to find bundled applications included in the installer, especially when using the “Update” option from within the previous version of the TuneUp software! Also I have now been waiting 3 days for a response from TuneUp customer service. Not a happy camper!! I am curious as to what the TuneUp software offered you or offered to do for you? Basically it offered to sort out incorrect mp3 tags. I propose that we share the Zako plugin code discussed and let everyone see that its harmless. the only thing this code have is to share the UID across browsers, which is stored in the uid plist file in the browser plugin folder. i’ll get the code shared within the hour so you can see for yourself. can you be clear about what is it that the installer is doing wrong? 2. have offer screens (toolbar and non-search products) where the user can choose if he/she wants doesnt want the offer. 3. installation is complete and product is launched. application bundles is nothing new, and help keeps software free to users. I’ve don’t have to prove anything. Stop messing with my computer. You are arrogant and reviled. it was built using firebreath so if you want to compile it there is a great video tutorial which explains how to install and setup firebreath. 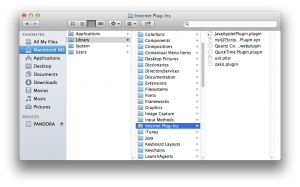 i hope that this will remove any doubts about what the plugin is and does. Finally I’ve had a response from TuneUp support. They confirm that the installer was written for them by Zako and that the optional Nation Toolbar is perfectly harmless. They have provided me with a link to an uninstaller for the Nation toolbar in the event that I have installed it!! Incidentally this response was prompted after I started posting negative comments on their Facebook page, where it seems that some people have been waiting a very long time to get any kind of reply! … And you trust an uninstalled provided by a criminal organization? I’ve been waiting around 2 weeks. I used to love tuneup, but since the update I would not recommend it to anyone. A happy ending to this story for me – I’ve had a refund from Tune-Up which I’d asked for but didn’t expect to get so full marks to them for that. They did tell me that they bundled these apps in order to make the upgrade free to existing users which is such a shame and I’d rather have paid for the upgrade as I’m sure most others would have also. However since the latest update is so full of problems regardless of the Nation toolbar I won’t be using it anymore.